Arrived at Seattle at 1.15 p.m. & put up at Stevens Hotel. Bathed, shaved & changed clothes. Walked around town some. Wrote to Ma, Perce, Ed, Floss, Warren, Robt Mountfort, and Daise. It is just like Summer here: grass green, trees in leaf & blossom, air balmy. No more N.E. for me if this is what we have out here. Will leave at 10 for Whidby. Am feeling fine but somewhat tired. Haven’t had any too much sleep. Washington is the best State I’ve seen yet. Met some relatives of Uncle Geo. at the hotel. Left for Oak Harbor at midnight. Arrived at Oak Harbor at about 10 A.M. Anna was on hand to meet me. All were glad to see me again. Louise is a cripple on acct of a lame knee, but can get around some. Sue & I drove over to San de Fuca & saw all the folks there this p.m. In the eve we had some music & a good time. Uncle Geo. has failed a good deal since I last saw him. Tom O’Leary is just recovering from a bad accident & so this is sort of a temporary hospital. Am anxious to get to Bellingham right away & will cut my visit short. Never saw such fine weather. Just like the best part of our early Eastern Summers. Staid around the house all day. Helped Tom and Uncle Geo. repair a fence. Took a few pictures. Wrote Ma a postal & forgot to mail it. Thot of telephoning Hull but the toll is 50c a minute so I gave it up. Louise & I have had a lot of music today & enjoyed it immensely. Am getting my lip up in great shape. Arose at 8 and took a sponge bath. Had breakfast with Louise. Staid around the house all the A.M. Practised with the revolver with Lou and scared all the livestock. After dinner Lou & I drove to Oak Harbor & I telephoned to Mr. Hull. He said to show up Tue A.M. Cost me 60c for a minute’s conversation. Am feeling fine but am covered with some sort of humor & it itches. Sent postal to Ma. Arose late & took a bath. Went up in the pasture with Tom to see a new born colt. It’s a funny looking thing. Helped on the fence a little while, called on Anna with Lou. Am getting sick of loafing & wish I had some old clothes on hand. Am feeling fine & getting fat. They have decided to call the new colt “Fred” in my honor. Anna & Louise drove me over to Aunt Kate’s & we simply raised the deuce all the way over. Spent the eve. with the old folks reading & talking. Tony & I cut down a big fir on his lot & I had all the exercise I wanted for a while. The tree is over 150 years old. Returned Mr. Vance’s rig with Tony. Had dinner at the latter’s home & ate a clam chowder made from the clams bought of Squinty, an old Siwash squaw. Showed the folks my albums & at 3 p.m. Tony drove me over to Uncle George’s. Had some music the the eve. & Uncle Geo. gave me letters of introduction to prominent people in Bellingham. Arose at 6.45, bathed, shaved, dressed finished packing. Had breakfast with Louise & a jolly one we made of it. Said good buy & kissed them all at about 9.30 & then Anna drove her sister Jennie Brazen & me down to the wharf wehre we took the boat for Seattle. Had a fine trip. 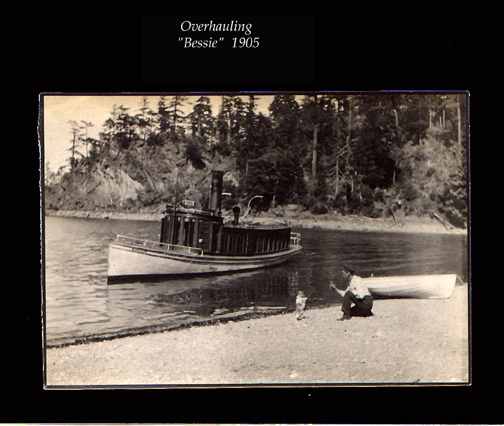 Arrived at 6, had supper & left for Bellingham at 8 p.m. on the Rosalie. Am feeling lonesome & miss the folks on Whidby very much. They have all been fine to me & given me a grand time, but the time has come to work and I’m ready. Wrote Ma & Lindsey. Capt. 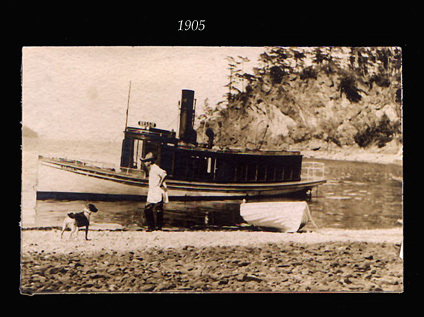 Dyer & I left Bellingham on the Bessie at 9 A.M. for Secret Bay, Lummi Island, where we beached her preparatory to cleaning & painting her sides & bottom. Dug some clams the first thing & had a good dinner on board after which we started in to clean her. Had supper on board, and then did a little fishing: no luck. 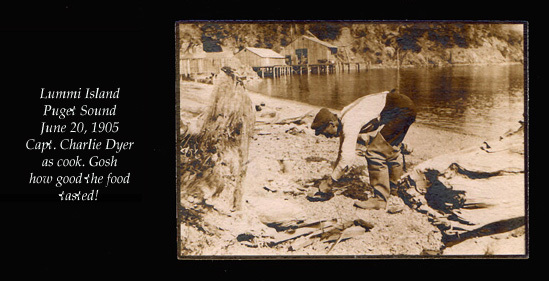 Rowed around & talked with some men who were after rock cod, & called on Mr. Griffin who has a tent here & making his living catching dog fish & extracting the oil. Towed the Bessie out a ways & then turned in, sleeping in the cabin on the seats. Am having a fine time. Great novelty for me. We took some pictures today. Had a good night’s rest & feel O.K. Arose at 8 bells & had breakfast on the beach. Built a fine little fire & made coffee & fried eggs. Great sport. Had good smoke & chat after breakfast & then sailed in to paint the boat after finishing cleaning. I did a good job painting her port side & find I have not lost my cunning in painting a water line. Played cornet on the beach much to the Capt’s delight. Built fire & had a good hot dinner at 3 pm. and a nap. Beached the Bessie this A.M. & while waiting for the tide to go down had breakfast. Almost finished the painting. After work we laid around read, smoked & snoozed on the bach. Quite a crowd came into the bay today on a picnic. This eve. I played cornet for the gang & got a good hand. One young lady in a boat handed me a couple of cigars. It blew so hard that the Bessie dragged her anchor & we had to be hauled back by the Pioneer. Dr. West’s party did not venture out till after midnight. The Capt. & I laid abed until very late then went ashore & had breakfast. Got up steam & started off for Bellingham at about 10.30 arriving there without mishap at about noon. Steered all the way & Capt. said I was a good navigator. Also said he had greatly enjoyed my company & help. Went home, ate a hearty dinner, shaved, bathed & went to the office. Reached Seattle just in time to catch the Fairhaven for San de Fuca. We were 2 hours late. No one to meet me so walked up leaving my baggage with Mrs. Fisher. Mamie brought it along with her also my letter which would have notified Tony of my coming. All glad to see me. Had to leave my trunk at Seattle. Helped Tony cloth my room, and put up a lot of my mounted pictures. Looks fine. The rain prevented our doing any hoeing. We went after my trunk soon after breakfast. Am learning to get up early. Cleaned jackets & cleaned & pressed 2 pairs of trousers. Lugged wood & water for both houses & am trying to make myself as useful as possible. Retire at about 9. Helped Tony pick chickens for tomorrow. Chief Squiqui (Billy Barlow) called while we were at work & gave us a heap big talk. Says the arrow head Tony gave me is 1000 years old. Sawed wood with Tony part of the time in the rain. Am getting used to hard work all right and it is doing me good. Called on the old folks a few minutes. Read in the eve., ran the separator & practised. Rose rather late. In the house most all day. Shaved soon after breakfast. Lots of company. Had a fine dinner. Called on the old folks a few moments. The ringing in my ear seems to be getting worse. Tony & I walked up to Vance’s to return a fence wire stretcher & I met a Mr. Blackiston there who cracked up Los Angeles to beat the band. Helped Tony get a big load of wood this a.m. Blocks from the fir we felled. Mr. Blackiston called & I gave him a Revielle & our firm card. He read my palm & predicts success for me. Did some hoeing. Went down to the “city” for the mail & found letters from Carl & Beth. She hadn’t heard from me for so long that she couldn’t wait any longer & wrote an agonizing letter, wanting to know what the trouble is etc. She thinks too much of me that’s sure. Case of distance lending enchantment. Ran the separator as usual & turned in at 9. Arose at 7. Worked nearly all day on the road with Tony, Messrs. Powers, Fischer, Vance, Douglas, Grasser, putting up a telephone wire. Drove team, put on buttons & nearly floated off the island in sweat. Lugging a ladder, putting it up alone is no soft snap and this experience I have had since landing has shown me what hard work is & will do me good & make work to come seem easy. Wonder what the Boston Manufacturer's Mutual Fire Insurance clerks would think to see me hoeing, milking, sawing firs, running the separator & putting up telephone apparatus. Since coming to Washington I have learned many valuable lessons & they have in part reconciled me to the change I have made for I believe it will mean money in my pocket and wisdom in my head in years to come. Among them - to let well enough alone, to keep quiet, to look at things excatly as they are from the start & not go on hopes or illusions of any kind, to deal with men carefully, to look out for No. 1 a little more than I have in the past, to not take too much stock in human nature & promises of any kind, to always feel hopeful, courageous, daring, cheerful and have all the fun possible. Boston would look awfully good to me now and if it had a climate like this I’d lose no time in going right back. Worked on the road all day with the telephone gang. Almost reached Coupeville. Had some of the hardest work I wever did in assisting Mr. Powers to force the reel through the underbrush. It was fierce!!!! Did me good & hereafter all work must seem lazy to me. Keep me from being lazy. Finished reading a Philistine. Retired at 10. Tony & I had a good swim & it put new life into us. Worked with the telephone gang all day and we reached Coupeville before noon. Had 2 glasses of beer, 1 milk shake & 1 cigar for dissipation and celebration/ Running the stretcher was my job today. Had as short horseback ride by kindness of a little fellow who happened along. Rec’d a 20 page letter from Beth. Louise has come over to help the old folks while they are not feeling well. Uncle George brought her over. Hoed with Tony most all the A.M. Went over to Coupeville in the p.m. to get Gypsy shod, etc. Attended a deer killing case at the court House & heard some odd questions asked by the lawyers. Bought some preserved ginger & had my hair cut. Another tete a tete with Lou and I enjoyed it you bet. She’s a jolly girl & I like her. Helped Tony bring down a new born calf. Quite a little excitement among the stock. Weeded most all day. Tony killed a lamb and it nearly made me sick to see him at work. Would not watch him kill it. Milked as usual. Made Anna quite a call this A.M. & had a good chat. Marshall, Tom, the boys & I rode over to West Beach & got a load of hump back salmon, about 300, 1800 lbs. Had quite a time. Left at noon & did not get back until supper time. Practised after supper, but didn’t feel much like playing. Staid around the house all day, reading and fooling with the kids. Louise & I had a fine time playing polkas this p.m. It made me think of old times when I used to play with Floss. Like Lou better all the time & we joke about getting married. We took a short walk this eve. & then went in & laid on the floor in the granary before the fire place while Sadie wrote a letter. Had jolly time. Worked in the wheat field all the A.M. Practised with Lou. We are getting my old polkas down fine. Lou expected Miss Leighton today but was disappointed. Wrote Ma a long letter. Arose late. Shaved. Wandered all over a part of the ranch & had a good communion with myself & Nature. Settled some things in my mind that have bothered me much of late. Am feeling O.K. now. John came down & we had a good talk. We will probably go to Los Angeles by Sept 1st. He had to go right back. Got him to Coupeville after a series of mishaps. Punctured Tom’s tire in pumping up & had to walk to Tony’s. Missed him there & finally found him at Fisher’s. The boat stopped at San de Fuca after all & so the whole business was balled up. John is my hoodoo. Staid at Tony’s. Finished packing up & said good bye to all. Louise drove me over to Aunt Kate’s & Carmelita went in with us. Stopped at Vance’s to get my books & magazines loaned to Harvey. Saw Dr. Blackiston & planned to meet him at Los Angeles as soon as he arrives. Went to San de Fuca for Tony to get bags & twine for wheat. Billy Barlow (Chief Squiqui) is helping him stack. The threshing crew arrived this p.m. Packed trunk. Big picnic at the house today. Miss Lou very much and all the Oak Harbor crowd. Finished packing up this morning. Practised a short time. Had a chat with Tony up in the barn. He hates to have me go. Aunt Sarah drove Misses Porter & Barnes & me to the wharf. My baggage was left so I got off at Oak Harbor where Lou met me & rode back to San de Fuca on her wheel after making a call at Katie Byrne’s & having supper with Lou. Spent eve. with the old ladies & Tony & left at 10.15. Had a lonesome time waiting for the boat. Played cornet down on the wharf.